- Auckland Museum houses the world's leading collection of Maori taonga (treasures) and, reflecting Auckland's place as the world's largest Polynesian city, multiple traditional and contemporary arts from throughout the Pacific region - The Museum's natural history and documentary heritage holdings are among the most extensive in the southern hemisphere - New photography showcases the key items in the collection in exquisite detail - Part of the successful Director's Choice series Auckland Museum, founded in 1852, just 12 years after New Zealand became a British colony, was the nation's first public museum. 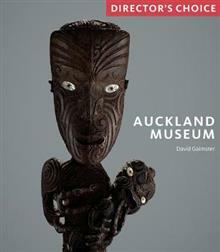 From the outset the Museum was encyclopedic in its collecting of 'specimens illustrative of the Natural History of New Zealand - also, Weapons, Clothing, Implements of New Zealand, and the Islands of the Pacific'. Starting in a farm cottage, the Museum is now one of the most important in Oceania. Dominating the central Auckland landscape, its monumental Greek Revival building is one of the visual icons of the city. The building is also a memorial to the war dead of the Auckland province, hence the Museum's full title, Auckland War Memorial Museum. Auckland Museum houses the world's leading collection of Maori taonga (treasures) and, reflecting Auckland's place as the world's largest Polynesian city, multiple traditional and contemporary arts from throughout the Pacific region. The Museum's director, David Gaimster, explores this extraordinary collection, each item with its own compelling backstory. Dr David Gaimster joined the Auckland Museum as Director in 2017, having previously directed The Hunterian, University of Glasgow, and the Society of Antiquaries of London and worked in senior roles at the UK Department for Culture, Media and Sport and at the British Museum. He has published extensively on archaeology, museology and cultural property.